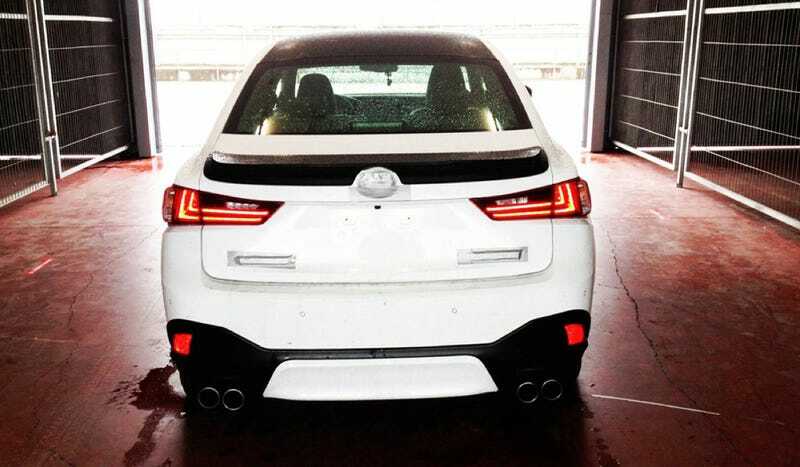 This is apparently the first photo of the 2016 Lexus IS F. Which makes sense, because it's hard to mistake it for anything other than a Lexus with a ton of exhaust pipes. This photo was posted onto Lexus Spain's Facebook page on Thursday, and picked up by Spanish website Periodismo del Motor. Based on what we learned in January at the Lexus RC F's reveal in Detroit, it's safe to say the IS F will also make "at least 450 horsepower" from its 5.0-liter V8. But fans of the stacked tailpipes on the old IS F will be disappointed as it's might end up being much more conventional this time around. Since we can't see anything but the back of this car, assume it will also have the crazy face and side bulges of the RC F, though perhaps toned down for this (slightly) more practical car. Expect the new IS F to be shown sometime later this year or early next year, and go on sale in 2015. Thanks for the tip, Hugo!